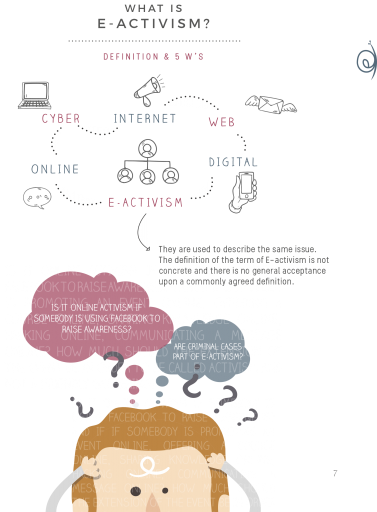 IYNF gladly presents the “E-manual on E-activism”, a publication that conveys the learning outcomes of the international training course “Act, React and E-act”, organized on 1-7 August 2016 in Prague. The project was part of a series of activities organized by IYNF on E-participation –, the main topic chosen to coordinate the work of the organization in 2016. The training gathered 30 young activists to exchange perspectives, share stories and tools to help create a successful online campaign. The idea for this e-manual was considered at the initial stage of the planning of the training course, whose resources would be put together by experts and participants from the project, and disseminated, laying the foundations for a concrete follow-up afterward. The goal of this manual is to share the gathered knowledge from IYNF and everyone involved in this year’s activities. This e-manual is created for youth workers and young activists but also for anyone else interested in the topic, individuals and organizations alike. It contains tools to help achieve a successful online campaign and to genuinely mobilize citizens, educate, make positive changes and build a stronger community with help of Internet. Young people with experience in non-formal education, activism, and youth work, created this publication, bringing in the most of their knowledge and practices in social media, online privacy and security, online communication, political sciences and even digital media. It intends to stimulate a reflection on what’s necessary to achieve desired online goals and why many times, goals are not achieved and activism fails to change the status quo. Finally, while being aware of security implications of our online activity, as the use of technology grows, regardless of our interests in activism, we need to be aware and sure that our rights and freedoms are protected. This booklet can, therefore, serve as a beginner’s guide to this wide topic.